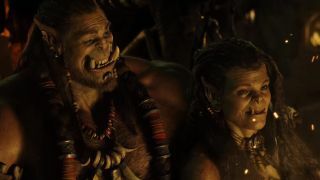 The Warcraft movie is "the high-wire act of filmmaking", director Duncan Jones says in the latest trailer for the film. I can see where he's coming from - portraying both massive clashes between armies and the complex relationships of their leaders will take quite a bit of balance and restraint. And bringing real, human (or orcish) life to swooping CGI cityscapes and battlefields will require a similar degree of care from the cast. You can also catch some extended versions of those scenes minus the commentary, if you prefer. Or just skip the actors entirely and watch the Warcraft movie trailer remade with World of Warcraft graphics. Directed by Duncan Jones and starring Travis Fimmel, Paula Patton, Ben Foster, Dominic Cooper, Toby Kebbell, and Ben Schnetzer, Warcraft: The Beginning will open in UK theaters on May 30, 2016 and in the US on June 10, 2016.